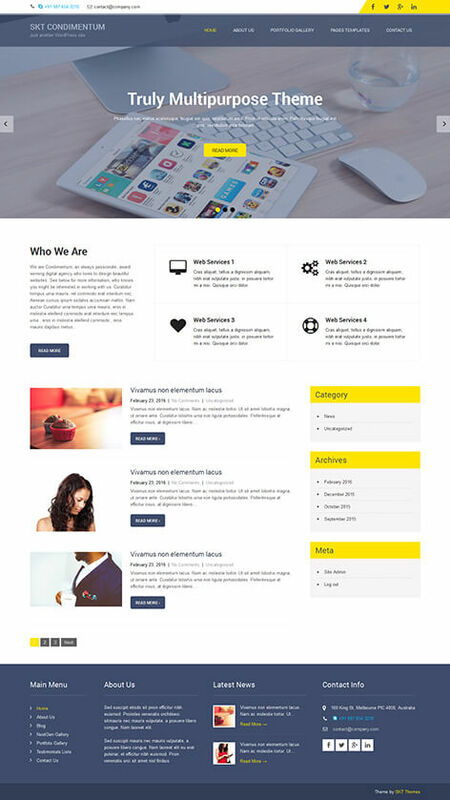 A free multipurpose WordPress theme which is 100% responsive as well as versatile and can be used on different kinds of niche websites. Passed the cross-browser compatibility test as well as mobile-friendly test. This free multipurpose WordPress theme is based on WordPress customizer which means customization of the website would be a cakewalk for anyone who even has no expertise in development. Comes with the important documentation which would act as a guide during the customization process. This theme has the support of all the important standard pages like 404, search, archives, category and blog pages. The homepage of this free multipurpose WordPress theme has the slider where you can add up to 5 slides which can help you to showcase your company more effectively. Compatible with all the footer and header widgets, and you can add whichever widget you like for the convenience of the viewers. Call to action given on the very top and at the bottom of the website. Support of Multilanguage because all the translation plugins are compatible with this free theme. Woocommerce plugin is also compatible with this theme which means you can sell anything on your website. Gallery plugins like Nexgen are also compatible with this free multipurpose WordPress theme. Coded with HTML5 and CSS3 and compatible with latest WordPress version. SKT Condimentum is a free multipurpose WordPress theme can be used for a range of different purposes such as for creating a personal blogs, business websites, landing pages and so on. A theme packed with features to help you create a masterful website. The business needs a great presence online to increase its outreach. The whole world has become one big place without any physical boundaries because of the virtual world providing a marketplace of its own. The business owners and industrialists want a website that is sophisticated and unique in its term. The purpose of the website could be to create awareness about the service and products that they deal in or just creating a pool updates to keep the visitors intrigued and interested in the business. There are top sliders which has three slides as default. These slides can be used with the flexibility of the developer to add text and images and make an impression. There is a menu bar at the top which is transparent; this allows these images and text in the slider to get undivided attention. The main menu gets five drop-down list that shows that the website can be scalable and allows creativity and flexibility. There is like a pool of options available for the developer while using free multipurpose WordPress theme as it is compatible with various widgets. Each such widget allows plug-in compatibility which means that the sidebars can be converted into dynamic sidebars. This plays a vital role in making the website attractive and responsive. There are also social media icons provided especially with this free multipurpose WordPress theme. They provide an easy setup and use for the visitors. It is an important aspect that every business should think about. Social media provides an instant connection with the visitors and also allows higher association and easy access. Along with this, the top corners have contact information, which means an immediate call to action in case of a query. There is a separate section for the company’s introduction. This ‘who we are’ section allows high-quality content to be included explaining the business strictly. This could be used for creating awareness about the legalities and the umbrella of other business if any. This allows a professional tone to the whole page and lets the business showcase their business ideas. There is flexibility here which allows the users to add services in this section. If not then a backlink can be created here to connect to the page where more detail information about the company or the services is provided. Every web developer apart from the specific features looks for a must have aspects that let the website run and function properly. To attract maximum visitors and to retain them all these features are required. The free multipurpose WordPress theme must understand the need and hence cover all the requirements. The theme is fully responsive; it has been tested to work well different browsers and different devices. There has been no problem detected. This has been possible with the quality of professional codes that are used while creating the theme. These day’s users often use different devices for searching things online. This includes smartphones, laptops, iPads etc. the themes should be responsive to them all and should not take a lot of loading on these different devices. These themes are also supported by documentation which allows the new developers to consult that when they are using them. The details of documentation provide help and support at all steps making it a great choice for creating a suitable website. There is no difficulty in setting up the home page. And there is various plug-in support available. The website can include chat options, live demos, and many other things without compromising on the experience of the visitors. This also goes a long way in making a long-term connection with the visitors who could be turned into clients shortly. This free multipurpose WordPress theme is designed keeping the industries in mind, and every business would need the WooCommerce compatibility to increase the business experience. The themes have just thought about it at the right time and have created compatible codes to allow easy transactions and communication. Compatibility is another special feature with which this theme is designed. It works fine with different plug-ins. There are google maps, translations which makes the business gain international connectivity. Translation makes an important feature as the business will grow exponentially if it allows information be accessed in local and acceptable languages. This free multipurpose WordPress theme also provide Flexibility. The colour scheme can be changed by the developer. Along with the colour, the fonts can be changed as per the requirements of the developer. There are many different fonts one can choose from and create the content which is easy to read and comprehend. Bolds and different fonts could be used for heading and subheading with a simple command. This helps highlight what is important. There is so much one can do with this free WordPress multipurpose theme because of its flexibility and versatility.